Back when I worked for international disaster relief missions, I heard some incredibly insensitive remarks directed towards grieving children. Some adults seem so overwhelmed by their desire to say something helpful in a time of bereavement, that they end up adding insult to a child’s emotional injury. According to marriage, family and play therapist Diana Bigham, M.A., Licensed Marriage & Family Therapist Supervisor, Registered Play Therapy Supervisor, adults should immediately remove the following clichéd phrases from their repertoire, particularly when talking to children. Although well-meaning people can say this, Bigham states that this phrase is confusing. It’s often understood by children to mean, “They’re better off gone,” which is certainly not what a grieving kid needs to hear. Why shouldn’t a kid cry when they’re in pain? Adults often say this because they’re uncomfortable with a child’s tears, and not because it’s even remotely helpful. “Children need permission to experience all feelings, including sadness,” says Bigham. “Grief takes time, and it waxes and wanes,” she explains. There may be months when children convey little sadness, and then the sadness floods back all at once — often due to a developmental milestone and new understanding of the loss. Children process grief differently than adults. They may not cry, but you may notice that they play out the grief with dolls or colors. According to Bigham, a lack of tears says little about their internal processing of the loss, and a brave face doesn’t necessarily mean that all is well. All this phrase does is create anger and confusion towards God. After all, how could God possibly need a child’s daddy more than he or she does? Staying busy is never the answer to grief — not for adults and not for children. “Busyness is not a solution, and it prevents a child from fully processing his or her grief,” concludes Bigham. Some of these clichés are clearly insensitive, but some are off-limits simply because they’re developmentally inappropriate. According to SheKnows Expert and clinical psychologist, Dr. Ben Michaelis, kids really don’t understand euphemisms for death, like “passed away” or “gone away,” until they approach 8-10 years of age. “Talking to kids with euphemisms like, ‘Grandma has gone away,’ can just confuse them even more, and cause problems later on down the line,” he explains. 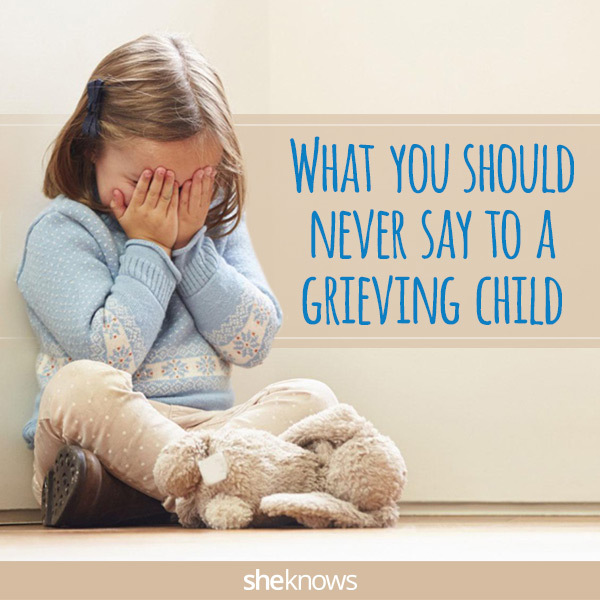 Michaelis added that the best thing to do for a grieving child is to speak honestly, directly and sensitively about the loss. Your child may need reassurance that he or she is safe, and that other family members are likely to live for a long, long time.